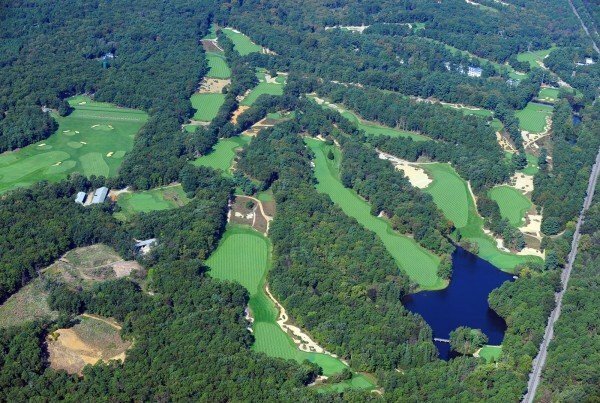 The Pine Valley Golf Club is a private course located in Pine Valley, Camden County. The membership list of the highly-rated, male-only club is mostly a closely guarded secret. Members are said to include former U.S. President George H.W. Bush, actor Sean Connery and legendary golfer Arnold Palmer. A fenced gate stops unwanted visitors at the East 3rd Avenue entrance to the Pine Valley Golf Club in Camden County. A greens crew member drives past the guard building at the main entrance on East Atlantic Avenue to Pine Valley Golf Club. The club has about 1,000 members from around the world. PINE VALLEY - The flag at the second hole perches atop a rolling, emerald hill so high it appears to kiss the clouds. The lush, mogul-filled fairway leading up to it features more climbs and dips than the "Hellcat" roller coaster at a nearby amusement park. The pin is tucked in the corner of an undulating green guarded by oval bunkers filled with ankle-deep, ecru sand. "This is what makes my job so great," one of the caddies says while the golfers gawked at the beauty. "There are times when I'm looking out and thinking, 'Man, this is the closest thing to Heaven on Earth.'" Welcome to Pine Valley Golf Club, not only one of the world's best golf courses, but one of its most mysterious. Golfers long to play there, to experience a unique, breathtaking layout that is only more special because it's located in the heart of southern New Jersey. But very few get the opportunity. Pine Valley's one of the country's most private clubs, ranked No. 1 in the world by Golf Magazine in its 2009-10 rankings. Golf's version of paradise is tucked away a few miles off the White Horse Pike, about 15 miles from Hammonton, just behind the roller coaster and the "King Neptune's Revenge" log flume at Clementon Amusement Park and Splash World. A few rights and lefts, a quick trip across the train tracks, a stop at the guard house, and you're there. Imagine if the Statue of Liberty had been built off the coast of Fortescue. If Mount Rushmore had been carved into the side of the West Cape May Bridge. If Michelangelo had decided to do some painting on the ceiling of a Wawa in Bridgeton. "I've been fortunate enough to play most of the top courses over the years," said ESPN analyst Ron Jaworski, who hosts a tournament at Atlantic City Country Club each spring. "And Pine Valley is definitely my favorite. My reaction when I play it is always the same. Every time I go, I get chills." 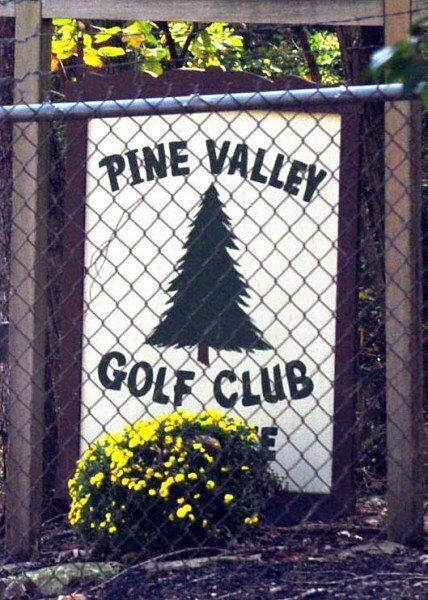 Pine Valley is an uber-exclusive, male-only club. Women are permitted to play the course on Sunday afternoons. There are about 1,000 members spread throughout the world, but the list is a closely guarded secret. According to various publications, members are said to include former U.S. President George H.W. Bush, actor Sean Connery and legendary golfer Arnold Palmer. Ben Crenshaw, who designed Hidden Creek in Egg Harbor Township, is also a member. Memberships are virtually impossible to acquire. You would have more of a chance batting cleanup for the Phillies in the World Series than joining the club. The membership committee is said to have a waiting list that stretches for 20 years. It's like trying to get season tickets to watch the New York Giants. Some golf experts have speculated that because Pine Valley is more about the course than the amenities, a person's playing ability is more important that his bankroll. Hidden Creek owner Roger Hansen, who has been a member at Pine Valley for 26 years, shot down that theory. "I know for a fact that's not the case," Hansen said with a laugh. "If it was based on playing ability, I wouldn't have gotten in." The only time Pine Valley is open to the public is the third week of September, when it hosts its annual amateur tournament called the Crump Cup, after Pine Valley founder George Crump. The former Philadelphia hotelier stumbled upon the land while riding on a train to Atlantic City one day in 1912. Visitors are allowed to walk the course during the tournament and enter the pro shop, but are not allowed to play. That privilege is reserved for members or guests. Because members are reportedly allowed to bring 24 guests per year, a round at Pine Valley is frequently a once-in-a-lifetime experience. "I got a chance to play there once, on Sept. 7, 2001," Philadelphia Eagles radio broadcaster Merrill Reese said. "I remember it like it was yesterday. Everything there was so pure, so spectacular. It felt like a religious experience." A recent visit backed up Reese's claims. One of the more surprising aspects of Pine Valley is its lack of amenities. There is no grandiose, sprawling clubhouse like at Hidden Creek. The second-floor locker room is small compared with those at courses such as Atlantic City. The most noteworthy section is the restaurant, where each table features a crystal container of sherry to be used in delicious snapper soup. Hats are not allowed in the clubhouse. Cell phones are not permitted on the golf course. There is also a no-tipping policy. Ultimately, it is all about the golf on a course that features 18 studies in beauty. "I've played most of the other (top-rated courses) and I can tell you that Pine Valley is my favorite," Hansen said. "Every hole is unique, every hole is special. And when you play it well, the thrill you get from conquering it is unmatched." Even if you don't play it well, just playing it is thrilling. A recent invitation from Hansen produced an exquisite journey that backed up the rave reviews. Pine Valley can be difficult. Natural sand traps encircle every hole, which sit atop elevations that are unmatched in this part of the state. Greens are so slick that 3- and 4-putts are routine. But it is no more daunting than local courses such as Atlantic City, Shore Gate and Stone Harbor. What sets it apart is its beauty. Most courses have a signature hole that is printed on its scorecards and brochures. Each hole has its own, quirky story. For instance, the fifth hole was a par 3 listed at 219 yards from the regular tees, but the caddies quickly handed us our drivers. "It's a lot farther than it looks," one caddie said with a smile. A majestic, 230-yard shot is what it takes to reach the green. No one in our foursome came close. The 434-yard, par-4 16th requires another lengthy carry over another gnarly waste area. One veteran member, who used to play on Sunday afternoons with his wife, accommodated her by building a tiny tee box on the other side of the sand. Years later, after they divorced, he had the tee box removed. It has since been replaced and is used by women and "super senior" players. The tee shot on 18 is the toughest. Not because of a narrow fairway or difficult carry. Swinging a club is hard when your legs are rubbery and your eyes are watery. Unless an invitation appears in the mailbox one day, it was the end of a once-in-a-lifetime experience. "Honestly, I don't think there should be a 'No. 1' course because people have different opinions as to what they think makes a great course," Hansen said. "It's all about what you like, what appeals to your eye. "But there's no question that Pine Valley is special. I get the chance to play here at least a couple of times a month. And I'm never disappointed." Pine Valley Golf Club has one of the top courses in the country. Atlantic and Cape May county residents: Would you visit Atlantic City more often if goods and services (parking, restaurants, retail, etc.) were discounted for county residents?